Prices stated are for guidance only and are subject to size and availability. Use the below hyperlinks to find plants in alphabetical order. 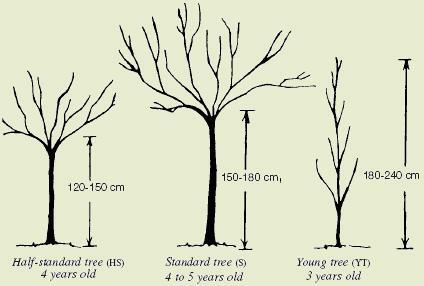 The maples mentioned here are all hardy decorative trees when established. Most withstanding dry and often difficult situations. A hardy native bushy tree giving excellent autumn colour. Yellow and scarlet autumn colour distinctive peeling bark. Makes a neat small tree, the branches striped with white. Good screen tree or windbreak; fresh green foliage turning gold in the autumn. A lovely variety whose foliage is the colour of the purple beech; makes a beautiful shapely specimen tree. The shapely leaves are edged with silver; a very attractive foliage tree. An attractive new golden species which holds its colour throughout the summer. When mature makes a good shapely specimen tree; good for screening in exposed positions. The spring foliage is beautifully suffused coral-pink; very slow growing and compact. Attractive green/white striped bark, leaves colour in autumn. (When available.) POT GROWN. Slow growing, double white which does not set ‘Conkers’. Price on application. Fast growing with glistening pear-like foliage, suitable for drier and windy sites. A fast-growing tree with bright green leaves; good in damp positions. A hardy tree, green leaves, grey beneath; ideal for wet situations. Popular verities such as Ballerina, Robin Hill and Snowflake are available in pots. P.O.A. A shapely small tree with a rounded head and a mass of white flowers in April; brilliant autumn tints. The twigs give a good winter effect. Similar to above, but with very compact rounded head. Suitable for smaller gardens, scarce. (When available). A smaller tree with outstanding white trunk and branches. Very large glossy leaves. Outstandingly white stemmed, taller growing. Notable for its shaggy bark. Best Birch for damp positions. Our native silver birch; graceful and pendulous habit; silver trunk. An erect form. Slow growing. Handsome tree with streaked greybark; will tolerate heavy but lime-free soils. A hornbeam of upright and pyramidal habit. Beautiful specimen tree. Excellent variety which remains narrow in maturity. A valuable ornamental or coppice tree. A very vigorous growing semi-evergreen, with masses of bright red berries in autumn and winter. Fast-growing small tree with semi-evergreen leaves and large scarlet berries borne in profusion. A small, dense-headed tree with glossy dark green leaves; fruits orange-red and very colourful against dark foliage. The double pink form of coccinea. Compact small tree, glossy green foliage, large bright red haws. Good autumn colour. The well known green Beech. A government embargo prevents any movement of this specimen. Therefore not available for sale. Ideal tree for small garden, with fern-like, purple foliage. Beautiful autumn colouring, needs light sandy soil. Selected form having excellent autumn colour. Curiously shaped three-lobed leaves, which turn yellow in autumn. Yellow green flowers in June and July. 150/180cm POT GROWN. A few Standards are available. Both flowering and fruiting varieties of this family are ideal for smaller gardens, having moderately bushy growth. With a few exceptions they flower following the flowering cherries. Fruiting forms give a fine display of colourful edible fruits, famed for jellies. It is wise to spray against Apple Scab as young trees. Round white flowered form with small yellow fruits – recommended/excellent variety. Small upright tree bearing white flowers, and prolificbright golden fruit until November. Neat and upright, fine crop of egg-shaped fruit, golden flushed crimson. A mass of pink and white blossom. Upright habit. Excellent variety, handsome foliage purple red in spring. Masses of rich red blossom in May. Retains its scarlet and yellow fruits until after Christmas. Deep purple foliage, wine-red flowers, small tree. New red flowered/purple foliage, disease resistant. Masses of purple-pink flowers, followed by red fruits. Coppery foliage. Disease resistant. Green leaf, white flower, purple fruit, upright habit, disease resistant. Neat with beautiful autumn colour. White suffused pink flowers in spring. Large-bronzed-red leaves. Fruits large red following crimson flowers. Strong growing. Slow growing tree, large serrated leaves, older trees produce purple-black raspberry like fruits. Used for jams, tarts and wines. Oval glossy dark green leaves up to 6-7m. Open tree with maple-like foliage, white felted beneath. A lovely balsam fragrance as the leaves unfold in spring. Makes a fine specimen where a vertical effect is required. A very fast grower of pyramidal habit; handsome glossy leaves; young foliage copper tinted. Medium growing, leaves tremble in the lightest breeze. Yellow autumn colour. Double rose pink in April, copper-purple leaves. Young leaves ruby-red, changing to claret; delicate rose-pink blossom. A recent introduction to this group; a profusion of blush-white flowers in spring, followed by edible bright red fruits; glowing purple foliage. Erect habit, resembling a Lombardy poplar; a column of pale pink blossom in spring; ideal where space is limited. 150/180cm. The most beautiful of the double-white cherries – masses of blossom. One of our most attractive native, autumn colouring trees. White blossom in spring. An attractive cherry with bronze-purple leaves; delicate single pink flowers. An interesting hybrid from our own nurseries. A vigorous grower, unusually scented, large white semi-double flowers. A tall narrowly pyramidal type with soft pink blossom, an ideal tree for smaller gardens. Most popular of all cherries, double deep pink flowers along with the young bronzy foliage; strong and upright growing. An attractive tree for the smaller garden, with soft pink blossoms early in spring. Upright habit and extra large, deep pink, double flowers. Pink flowers, rich autum foliage. Medium tree. Conical fast growing tree, pale pink flowers with polished brown bark. One of the most attractive trunks in the winter. Appears like polished mahogany. Flowers large, snowy-white and early; a distinct variety with rather horizontal branches. An upright small tree with white flowers. Attractive bronze foliage with early single pink flowers. Pale pink in bud, the large white flowers hang beneath the young bronze-green leaves; graceful, rather pendulous habit. Producing semi-double white flowers intermittently from November to March in mild spells. This is a pale pink form of Autumnalis. Immense single snowy-white flowers, enhanced by rich coppery-red of the young leaves. Creamy-yellow double flowers shown to perfection against young amber-coloured foliage. Narrow, upright tree. Single white with good autumn colour. A profusion of blush-white and almond scented flowers; a graceful tree. A handsome small tree, bearing buddleialike sprays of white, slightly fragrant flowers in April and May. Neat upright ornamental pear, glossy green leaves turning orange red in autumn. Upright tree often holding its shiny foliage till the following year (white flowers). One of the best silver foliaged trees, masses of white blossom in spring, upright in habit. We recommend planting smaller sizes due to transplanting problems. Glossy green leaves, fast growing. An evergreen variety which thrives in any soil. Not suitable for cold districts. Available in several varieties, mainly with coloured stems, as whips in different sizes. A healthy vigorous variety in all soils. Excellent for fast screen or windbreak. A small tree having bright, golden leaves in spring. Slow growing. Leaves silver in spring, white underneath in summer; red berries. Valuable for exposed and windy places; white flowers and red fruits; grey-white leaves with yellow down beneath. A small distinctive tree with close ascending branches. Grey–green foliage. Suitable for confined spaces. Native medium sized tree, silver foliage in spring, large bronze fruits. Small neat form with amber yellow fruits. Native common Rowan giving masses of orange red berries. Elegant tree, attractive red berries in autumn. Strong grower with lovely ferny foliage and golden/copper coloured fruit. A beautiful Himalayan species, fern-like foliage and pinkish flowers, followed by very large white fruits. Slow growing. One of the best varieties for autumn colour, orange-red berries, neat upright habit. A moderately sized upright tree, whose chief glory is its scarlet autumn foliage. Orange-red fruits. Heavy bunches of orange/red fruits, strong growing. Distinct blue-green foliage, fruits white tinged pink, autumn colours. Slow growing, erect and columnar habit, leaves green, grey underneath. Scarlet berries. An outstanding Mountain Ash. Growth is compact and colours well in the autumn. Pale yellow fruits persist into winter. Sticky buds opening to large leaflets, giving rich autumn colour. Huge clusters of orange-red fruits. Glossy green frond like leaves turn purple red in autumn. Red fruits. Compact and upright growing, orange-red berries. A small tree of spreading habit, fern like foliage. Rose red fruits turn to pale pink. fresh glossy green foliage throughout the summer. large leaves, white felted beneath.